We opened Paintbase nail salon to fill a void in the market for a safe, clean and stylish place to conveniently accomplish beauty maintenance. Our instruments are cleaned in a hospital-grade autoclave and sealed in sterilization envelopes until they are used. Our pedicure sinks do not use whirlpool jets, which cannot effectively be cleaned and therefore can harbor hazardous bacteria. Our nail technicians follow a dual handwashing policy and must thoroughly wash their hands both before and after services. You can always request that your nail technicians wear latex gloves during your service as well. We use disposable nail files, buffers and cuticle sticks which are discarded after each service. We do not use dangerous razors and graters. We seek out the healthiest and highest-quality products! We carry a range of nail products and beauty items from industry leaders OPI and Essie. We are also proud to carry RGB Cosmetics, a beautiful “5-free” nail care line; 5-free products are free of formeldehyde, formeldehyde resin, toluene, camphor or DHP. RGB is an industry leader in both quality and a commitment to healthier standards in the beauty industry. We do not offer acrylic products, which are both harmful to the health of our nail technicians, but also to overall nail health. We constantly look for new products and methods that will help us offer the highest quality, healthy and safe service in the industry. 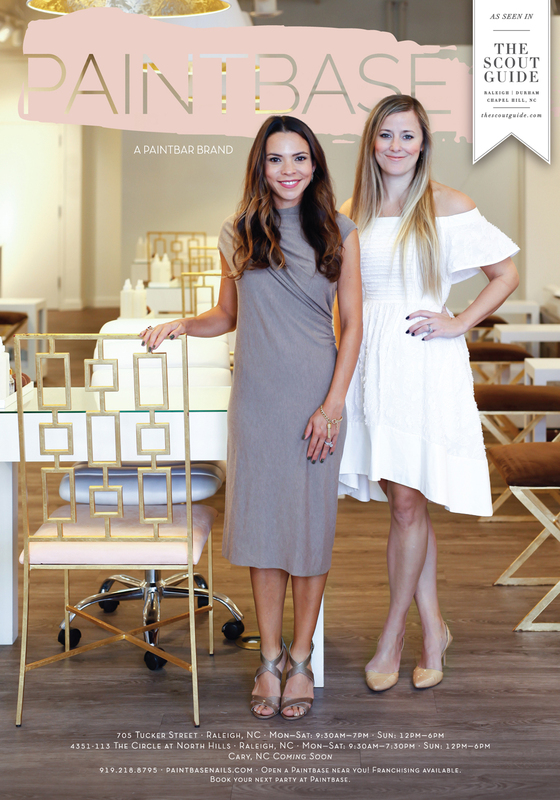 Paintbase owners Heather Brewer and Catherine Fain have a shared desire to create a better nail care experience. They saw a need for a more health-focused nail salon that actually makes beauty maintenance fun and enjoyable without sacrificing convenience. Heather is an accomplished attorney and mom of two. She is originally from Rocky Mount, NC and attended the University of North Carolina, Wake Forest University and Georgetown University. Catherine has a long history in the fashion/retail industry in addition to a marketing background. She is from Raleigh, NC and attended Clemson University and the University of South Carolina.